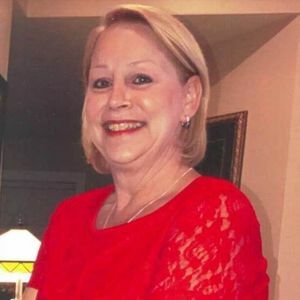 Brenda Gail Sweet, 53, of Summerville, South Carolina, wife of David Boyd Sweet died Friday, June 15, 2018. Her Funeral Service will be held Tuesday, June 19, 2018 in the J. Henry Stuhr, Inc., Northwoods Chapel, 2180 Greenridge Road at 12:00 pm. Interment will follow at Carolina Memorial Park. The family will receive friends Tuesday from 10:00 am to 12:00 pm in Stuhr's Northwoods Chapel. Brenda was born December 28, 1964 in Charleston, South Carolina, daughter of the late Frank Euler NeSmith and the late Frances Guarnella Parson Blackwell. She was import manager at JAS Forwarding in Ladson, SC. In addition to her husband, she is also survived by: son, David Boyd Sweet, Jr. (Katharine) and daughter, Lacey Nicole Sweet, both of Summerville; grandchildren, Brookelynn and Kennedy Sweet; two sisters, Patricia Taylor (Bill Taylor) of Summerville and Debra McFarland (John) of Vero Beach, FL; two brothers, George Blackwell (Dawn) of Madison, WI and Jimmy Blackwell (Katie) of Moncks Corner, SC. In lieu of flowers, memorials may be made to American Heart Assoc. of SC Memorial Processing Center, 4217 Park Place Court, Glen Allen, VA, 23060. My sincere condolences to all the family. I worked with Brenda at BDP International. I'm so very sorry for your loss. My thoughts and prayers are with the whole family. I worked with Brenda over the past 3 years and was always impressed with how she was always so prepared, pleasant, and helpful. My heart is so saddened by this news. She was truly a gem, and taken from this world way too soon. Prayers for Brenda's family, friends, and colleagues. There are no words I can offer to comfort you in this tragic loss. Brenda was a wonderful person: a wonderful boss and friend. Her family meant everything to her. The world is definitely diminished with her loss but heaven is much brighter. Brenda definitely fought the good fight; finished the course and kept the faith. She now has a crown of righteousness. God's arms are around you as are my own. May you find comfort in His Love. So sorry for your loss. She was a lovely lady. Always kind. We all at Prestige Impex, Inc. are shocked to hear that Ms.Brenda Sweet is no more. She was our go-to person at JAS and we have been doing business with her & JAS for a very long time. She was truly kind and as her name says - really sweet to work with. She will be dearly missed. We pray that her family finds strength to recover from this major loss. May Brenda's soul rest in peace. All at Prestige Impex, Inc. The picture of Brenda is perfect. She always had a smile that also showed a little mischief !! I knew Brenda for many years when she was with BDP. She was extremely knowledgeable and always helpful. In these difficult times, I focus on all the fun times and perfect moments with her and I can only smile too. Family, we send our condolences during these try times. Reminisce on and treasure your memories of Brenda and; be assured that the God of Comfort has her tucked away in his memory as well. Life Stories provides friends and families a forum to post their favorite stories and memories of Brenda Gail Sweet ensuring the precious experiences are never forgotten. Share joyful times, post a photo that captures the moments you cherish, and allow others to reply, relive and remember.